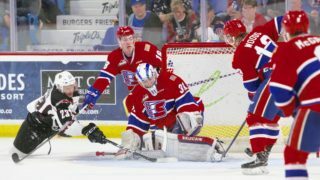 SPOKANE, Wash. — The Spokane Chiefs’ offense stayed hot on Wednesday night, scoring six goals on their way to a 6-2 win over the visiting Saskatoon Blades. Ethan McIndoe led the way with his sixth and seventh goals of the year as the Chiefs moved into second place in the U.S. Division. Saskatoon got on the board first after a shot by Kirby Dach bounced off of the post and into the chin of Chiefs defenseman Luke Gallagher, rebounding into the Spokane net at 2:27 of the first period. Spokane wasted no time in answering. Ethan McIndoe drove the net just 2:20 later to redirected a pass from Filip Kral off his skate and past Blades netminder Nolan Maier to even the score at one apiece. 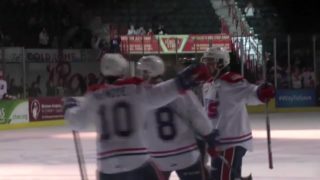 McIndoe scored his second goal with 6:28 left in the period, poking a loose puck across the goal line off a deflected Tyson Helgesen shot to give the Chiefs a 2-1 lead. Saskatoon scored first in the second period as Dach netted another off a nice feed from rookie Alec Zawatsky at the 2:15 mark to tie the game at 2-2. 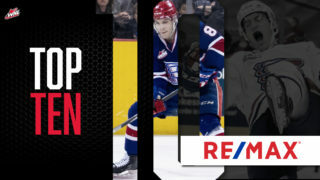 Spokane’s Jaret Anderson-Dolan retook the lead midway through the second, corralling a blocked Dalton Hamaliuk shot on the right wing and snapping it home for his 10th of the season. Hudson Elynuik put Spokane firmly in the driver’s seat with 1:12 left in the middle frame on a very similar play, settling a bouncing puck on the power play and firing it home to make it 4-2. Zach Fischer potted his 10th of the year, also on the power play, at 3:33 of the third with a strong wrister from the left circle. Nineteen-year-old Jeff Faith deflected a point shot midway through the third to cap the scoring, with assists to Helgesen and Ty Smith. 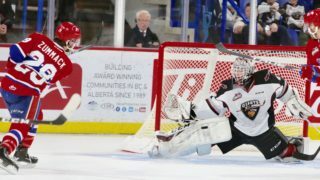 The Chiefs outshot the Blades 38-25 on the night, finishing 2-for-5 on the power play and 4-for-4 on the penalty kill. 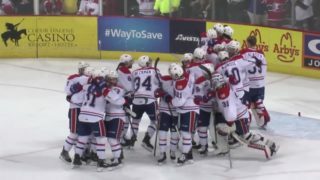 The win pushed Spokane into second place in the U.S. Division, one point ahead of the Tri-City Americans. Spokane has now scored 32 goals in their last seven games. Spokane returns to action Friday, December 1 as the Kelowna Rockets return to Spokane Arena. It will be Coeur d’Alene Casino Night at the Arena with gifts and prizes being distributed all throughout the game, courtesy of Coeur d’Alene Casino. Additionally, U.S. Marine Corps will be on hand to accept new, unwrapped toy donations for the Toys 4 Tots program. 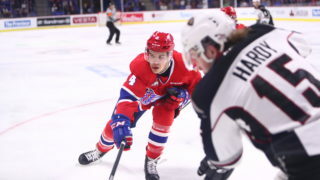 Tickets for Friday night and all Chiefs home games are available in-person at the Chiefs’ Ticket Office, over the phone at 509-535-PUCK and online at spokanechiefs.com.